Danao City, better known in the world for making illegal near perfect copycats of Smith & Wesson revolvers, Colt 45 pistols or other automatic handguns, or where its long dead residents rise from their graves on election day, will soon be talked about in the world as the birthplace of the mother of the world’s figure skating superstar. Our Danawanon reporter in Washington D.C., Boyito Quiroz, recently brought to our attention that a daughter of a young mother from Sabang, Danao City has consistently won major figure skating competitions in the State of Massachusetts and on her way to grabbing the limelight in the nation’s figure skating scene at a young age of 13. Her name is Keilani Lynn Rudderham. Her mother’s name is Marilis “Bebeth” Quiros who is the youngest sister of my father. Ate Bebeth was married to an American of British descent, Larry Rudderham. They were married in Maslog, Danao 18 years ago. They have two children, the older boy is David. 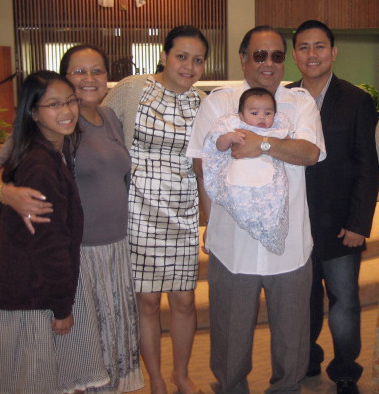 The Rudderham family visited Danao around 10 years ago but Ate Bebeth went home recently when her father and my grandfather Isabel Quiros died few years ago. BOSTON — The moment she glides onto the rink at the Skating Club of Greater Boston, it’s clear that Keilani Rudderham is something special. At only 13 years old, the Tyngsboro eighth-grader will be competing for a U.S. Figure Skating National Championship on January 18th. Rudderham recently won the New England Regional Championships and placed third in the Eastern Sectional Championships. Despite skating against girls as old as 17, Rudderham has been able to stand out. Off the ice Rudderham, tall and charismatic, looks like most girls her age. However, on the ice she looks more like a grown woman than a middle school girl. Elegantly and effortlessly carving up the ice, performing breathtaking jumps and complex combinations, Rudderham looks totally comfortable. Rudderham started skating at the age of two, inspired by watching her older brother play hockey. Although she started in hockey skates, by the time she was seven she was lacing up figure skates. It was then that she began training with private coaches, and she’s been skating everyday since. This will be her first time competing at the National Championships and it should help guide her towards the ultimate goal; competing in the Winter Olympics. Most days she has less than an hour of free time, but what matters most is her time on the ice. Boyito Quiroz recently contacted dausa.org expressing his appreciation for having this website that connects Danawanons with their loved ones, friends, relatives or classmates of long ago, wherever in the world they may be. He said he came to America barely a year ago with his family in tow, including his parents, a privilege granted to foreign diplomats, U.N. personnel, including employees of World Bank where Boy and his wife work. Boyito is from Sabang, Danao City where he finished his elementary and high school. He studied for the priesthood at the CICM Seminary in Bacolod but later discovered he had another calling in life. Most of the Filipino households are numerous. This is not to exclude my parents. Both of them belong to a quite large family. My mother has 8 brothers and sisters and my father has 7. When my grandfather Lucio Andrade passed away, there was a count of more than 50 grandchildren and great grandchildren. Much more, in my Quiroz lineage. The barangays of Maslog and Sabang in Danao City are filled with Quiroz descendants. 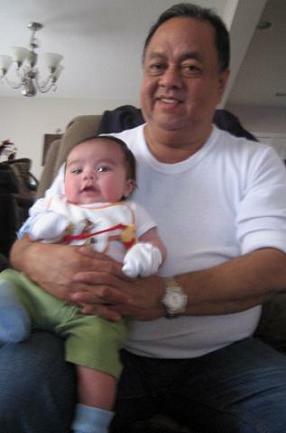 There is a trace of Quiroz or Quiros to every family native in the area. This is just to show how fruitful the family tree where I belong. However, this is not the case with my own immediate family. I have only one sister and no brother at all. For health reason, my mother was advised not to give birth anymore after my younger sister was born. If not because of that, I think I may have plenty of siblings as well. Much more I realized that priesthood was not meant for me. If patience just took place, I could have been a missionary and a religious. There is no doubt that I will not enjoy and experience of being a family man, as celibacy is an inherent value and almost equivalent to priesthood. I usually introduced myself to new acquaintances and to old friends that I have 4 children. Most of the time, if not always I received a “wow” response not because that I look younger to having four, hmmm. Having been here in the US for one year, I understand and realize that it is extraordinary normal to have more than 1 child. This is not to mention the expenses related to child care and the needed quality time allotted to each child’s development. I have not encountered these as I am lucky to have my parents helping me out taking care of the children and other household activities while my wife and I go to work on weekdays. My big family. 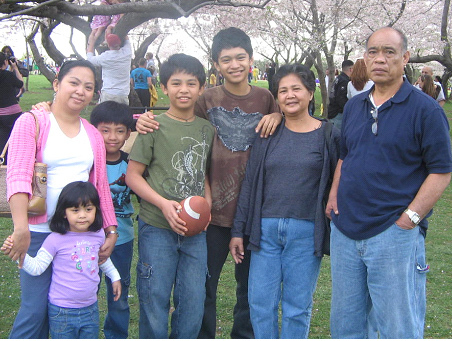 My wife, my four beautiful children and my parents during the Cherry Blossoms Festival in Washington DC. Just to live in the US is a challenge in itself. I can count hundreds or more reasons to be worried about. After 1 year of stay, the youthful myths that US is a country of honey and green money is fading. It was even aggravated that the economy is down and struggling and many faced unemployment. Even with hope, the future may seem hard and difficult. The job which I thought is just around was hard to reach. My father whom we expected to have been given his work permit found nothing yet in the mailbox. Another level of challenge pertains to growing-up children. As much I would like them to remember our values and speak our native tongue, they started to speak otherwise specially with my youngest. She understands Pilipino because she was born in Metro Manila but it sounds awkward anymore to hear her utter salamat or magandang umaga with an “h” in between the letters and with air coming from her nose. She seems not interested anymore to speak the dialect. I should be adventurous to food as my children no longer like the food I usually cook and enjoy to eat since I was young. They prefer chicken and pasta. My “inun-unan” and tinuwang isda are always keep untouched. Rather than to be sad like the lifeless trees in winter, I always count our blessings. I remember five years ago when my wife and I were lining up early morning at the US Embassy in Manila carrying the documents we prepared for months. It turned out that we were only asked for 3 questions and told right away by the consul that she was not satisfied and stamped our passport with received which meant decline. It is a blessing that we were able to come to America and not even asked to go to the Embassy. My parents and my wife’s parents were given the same visa but did not experience lining up for the interview. It is a blessing that there is a good public school system where my children continue to develop their talents. It would cost us half of our earnings, like we did back in the Philippines to have quality education. We no longer have to worry where to get the tuition fee at least until they finish high school. Mr. Benjamin Ypil is a good friend from Danao, a classmate at Santo Tomas School, ex-seminarian (good he left – being a potential embarassment to the Archdiocese – too irrestible to girls – according to him), former Freeman columnist, former PR of Governor Gullas, retired PR Consultant of Napocor, a widower, now single and actively on the look out for a 2nd time around. We asked him to write for dausa.org, and willingly he sent us a nice piece. So, this is America! I left Cebu for Manila 5:20pm on March 24, a Monday, then took a connecting flight at 10 pm for Los Angeles which was my port of entry. My daughter in Fort Wayne, Indiana was worried sick because her friend whom she requested to meet me at LAX at 7:35pm (L.A. time) failed to fetch me at the airport arrival area. Anyway, my daughter’s friend was unable to recognize me. How could she when she was told that I had a moustache and a goatee with a bulging tummy to boot? Except for the stored fats in my stomach,I had long shaved off my bigote and my bungot! Thank God, the nature of my job back home in our country requires me almost always to be on land, air and sea travel! Otherwise, I would have been gobbled up and lost in the hustle-and-bustle of the gigantic Los Angeles airport. Well, probably because I’m never ashamed and timid to ask people for assistance (blame it on my experience as a newsman and public relations practitioner) I can easily adjust and adapt to any emergency situation. The moment I saw Rafael my jet lag was gone! I realized I just logged a total of 18 hours and 40 minutes in my plane travel from the Philippines all the way to my final destination. At any rate, I’m here at Fort Wayne, Indiana on some apo-stolic mission (euphemism for babysitting for my grandson, my second and all boys). I love Rafael as much as I hate the weather here. Although it’s now the onset of spring but I got the taste of snow on the second week after my arrival. So, here I am now doing a l63, better known in ABS-CBN as “Bantay-Bata.” On weekdays, Rafael and I are left at home while my daughter and son-in-law are out working. It is, more often than not, only during weekends that I am able to go out malling or dining. To kill my boredom, I contact my kith and kin here, thanks to Monching Barriga, my classmate during our michievous days in highschool at Santo Tomas in Danao whom Timmy Laurente, another classmate has called the immigration officer here in the U.S. But, of course! Monching is virtually the walking directory of all Danawanons here. So far, I’ve already gone to Chicago, just a three-hour drive from our place and visited my cousin Pablo Ypil and Edna. If not for this swine flu virus, I would have already travelled to New York, Maryland and Washington D.C. But I couldn’t risk the safety and well-being of the apple of my eye, Rafael for these tourist sites who’d necessarily go with us on these trips had they pushed through. At any rate, I still have a lot of time to visit my friends and relatives. My return trip to the Philippines will still be on Sept. 2 in time for the fiesta in Danao. In my itinerary are places like Las Vegas. Los Angeles, Maryland, Florida and New York where the hubby of my niece and daughter of my elder brother Prudencio is the Philippine consul.